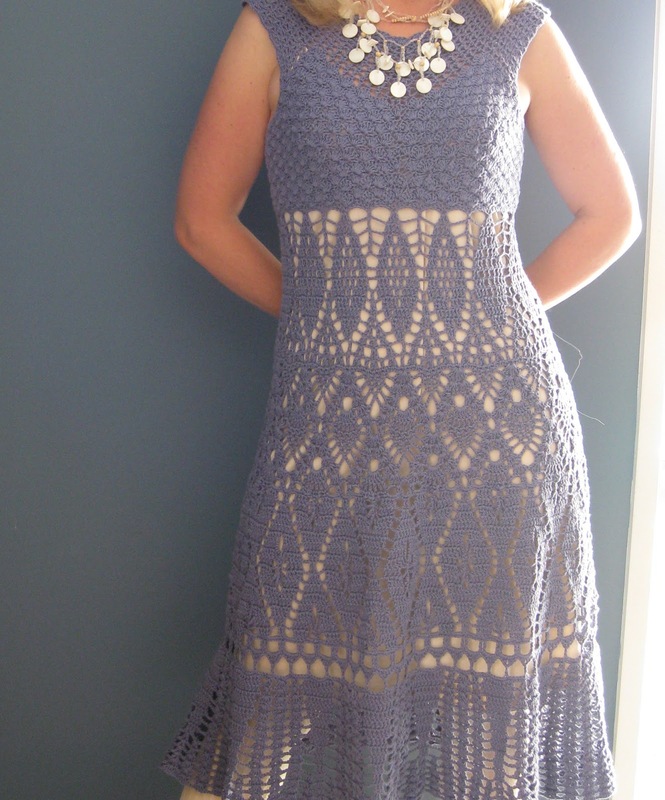 This is the Lily Chin Lace Dress from Interweave Crochet 2004 magazine and also still available online at the Interweave Store. You can see all the details on the Ravelry Pattern Page for it. It is a huge amount of work, with nearly every line of the pattern different from the one before, but not difficult in that the pattern has a real logic to it. I am so happy be one of the ones that have made it. means that it doesn’t create a problem. The pattern errata can be found by looking at some of the finished projects on Ravelry, including mine here. You can also get it from Interweave here. I did find the gauge to be a bit large for me and had to drop my hook size down to 2.5mm to get it to meet guage. I made the 34″ even though at the time I made this I was a 36″ and it still was big on my frame, so I would advise people to size down. Over time, even though I did not really wear this dress, it seemed to grow and grow. The armholes ended up inches too low. That combined with losing the baby weight (18kg in total) meant that this dress was unwearable, it was just too big and the armholes were too gaping. As it is 100% cotton, I decided to throw caution to the wind and attempt to shrink the dress (praying I didn’t destroy it). I did this by throwing it in the washing machine on a hot wash and then throwing it in the tumble dryer on the hot setting to dry it. It freaked me out to do this as I would normally never treat a handmade treasure like this so roughly. I’d like this dress just a few inches shorter. But the result was better than I hoped for: it came out perfectly shrunk about 3 sizes smaller. It is still a little roomy so if the dress stretches/drops again I will do the process again.